Proof Bran Is the Night King in Game of Thrones Season 8? If you haven't seen the Game of Thrones Season 7 finale yet, there will be plenty of SPOILERS below, so make sure to read at your own risk. While Game of Thrones fans are known to watch every episode like a hawk, scouring each frame for Easter Eggs and other clues, it seems most fans missed quite the huge Easter Egg, which may even confirm a theory about the Night King that has been picking up steam all season. Again, if you aren't caught up with the Season 7 finale, read on at your own risk because there will be SPOILERS below. With the help of his resurrected/undead dragon, the nefarious Night King destroyed a huge portion of The Wall at Eastwatch, which was more than enough for his army of White Walkers to set foot in Westeros, marching South, as this seven-episode season came to a close. What most fans didn't notices is that during one brief shot, the show's writers and producers seemingly dropped a huge Easter Egg, which may or may not confirm a theory that Bran Stark (Isaac Hempstead Wright), a.k.a. the Three-Eyed Raven, may also be the Night King. A Reddit user noticed that an aerial shot of the white walkers heading into Westeros formed quite the distinct pattern, which, when you take a closer look, is actually the head of a direwolf, the House Stark sigil. 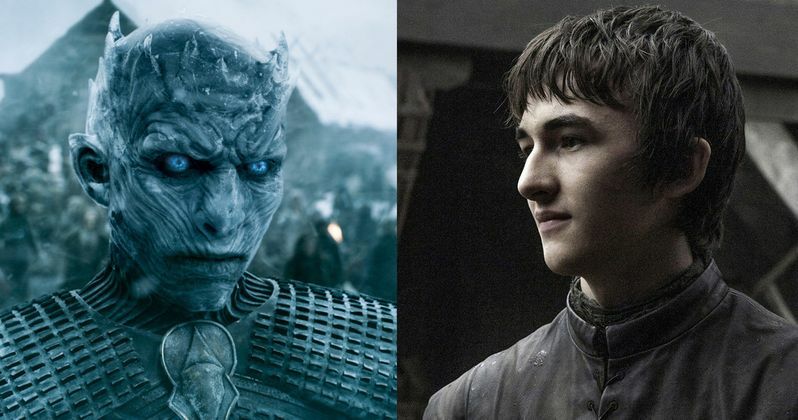 While it's possible that this could be a complete coincidence, there has been a theory positing that Bran Stark is the Night King for quite some time. The theory suggests that, in Season 6, when the previous Three-Eyed Raven (Max Von Sydow) was teaching Bran how to go into other people's consciousness, an ability known as "warging." Bran has a vision about when the Night King was born, the first ever White Walker, who was created during the war between The First Men and the Children of the Forest, who were being decimated in this war. They captured one of the first men and secured him to a weirwood tree, and during a ritual, dragon glass was inserted into his chest, and the first White Walker was born. Many viewers noticed that, when the dragon glass was inserted, Bran, in the cave, winces and clenches his fists, making it seem like he's actually in pain. There is other evidence as well, as pointed out by a Twitter user dubbed Westeros Watch, who put together a video that showed Bran walking, during a vision when he sees the Night King last season. When compared with a scene from this season, it's clear that both the outfits worn by Bran and the Night King are quite similar, practically identical. The previous Three-Eyed Raven told Bran that the "ink is dry," regarding the past, meaning he cannot change the past, and also that the more time Bran spends warging into someone, the harder it becomes to get out of that person. There is also speculation that, through all of this warging and time travelling, that Bran Stark is also actually a number of historical characters named Brandon, such as Brandon the Builder, who built The Wall, but, like all other Game of Thrones rumors, that has yet to be confirmed. HBO hasn't issued a specific premiere date yet for Game of Thrones Season 8, but it is believed to premiere in either late 2018 or early 2019, although no production start date has been given. Take a look at the image from Sunday night's Game of Thrones Season 7 finale, which shows what appears to be a direwolf symbol formed from the horde of white walkers.